Meet the Horses of the New Orleans Mounted Unit. Each one is a valued member of the New Orleans Police Department. Ace is a Percheron/ Thoroughbred Gelding. His coat is a Dark Bay and he stands 17 hands high. Ace weighs about 1575 pounds and his favorite treat is grain. Ace was born in 2002 and has been served in the New Orleans Mounted Unit since 2006. Fun Fact: Ace is very photogenic, he loves to have his photograph taken and he is a big crowd pleaser. He stretches out his front legs and then pops back up almost as though he were taking a bow for his fans on Bourbon Street. He is quite the showman. He has served the Department with pride and grace through many Mardi Gras’ and countless other special events. Tank is a Percheron/ Thoroughbred Gelding. His coat is a Dark Bay with Hind White Socks and he stands 17/2 hands high. Tank weighs about 1610 pounds and his favorite treat is hard peppermint candies. Tank was born in 2004 and has served in the New Orleans Mounted Unit since 2012. Fun Fact: Tank was bought from Angola by the Orleans Parish Sheriff’s Dept. He came to NOPD about 5 years ago when he was donated to us by the Sheriff’s Dept. He had a cancer scare a while ago but was treated and the cancer removed and has since made a full recovery. He has gone back to regular duty with his rider and is doing well and enjoying his work. Gypsy is a Percheron/ Quarter Horse Mare. Her coat is Champagne and she stands 16 hands high. Gypsy weighs about 1380 pounds and her favorite treat is cherries. Gypsy was born in 2002 and has served in the New Orleans Mounted Unit since 2007 part time and 2009 full time. Fun Fact: Gypsy is the off spring of a mare by the name of Angel who was also utilized by the Mounted Unit in years past, making her our only second generation NOPD mount at present. She was used on a part-time basis until she was purchased from Angola in 2009. Gypsy has served in 9 Mardi Gras seasons as well as numerous other special events throughout the years. Josey is a Registered American Quarter Horse Gelding. His coat is a Red Dun and he stands 15/1 hands high. Josey weighs about 1320 pounds and his favorite treat is a pat on the neck. Josey was born in 2011 and has served in the New Orleans Mounted Unit since 2014. Fun Fact: Josey is an American registered quarter horse and comes from a well-bred cutting line. He is quite a character, he is usually the center of attention when patrolling and loves it. He won’t let you pass him by without saying Hello. He is also used as the training example in our Mounted classes. He has a lot of grit and is as tough as his name sake “Josey Wales”. Dude is a Percheron/ Thoroughbred Gelding. His coat is Grey and he stands 16/2 hands high. Dude weighs about 1425 pounds and his favorite treat is cookies. Tank was born in 2002 and has served in the New Orleans Mounted Unit since 2006. Fun Fact: Dude has served the NOPD for many years through all types of special events including numerous Mardi Gras’ seasons and being part of the Rodeo Grand Entry at the UNO lakefront arena in Sept 2014 for which he got his photo posted in the advocate. Dude is also one of the favorites for our new riders during our training classes. Conan is a Dutch Warmblood Gelding. His coat is Bay and he stands 15/3 hands high. Conan weighs about 1285 pounds and his favorite treat is apple horse treats. 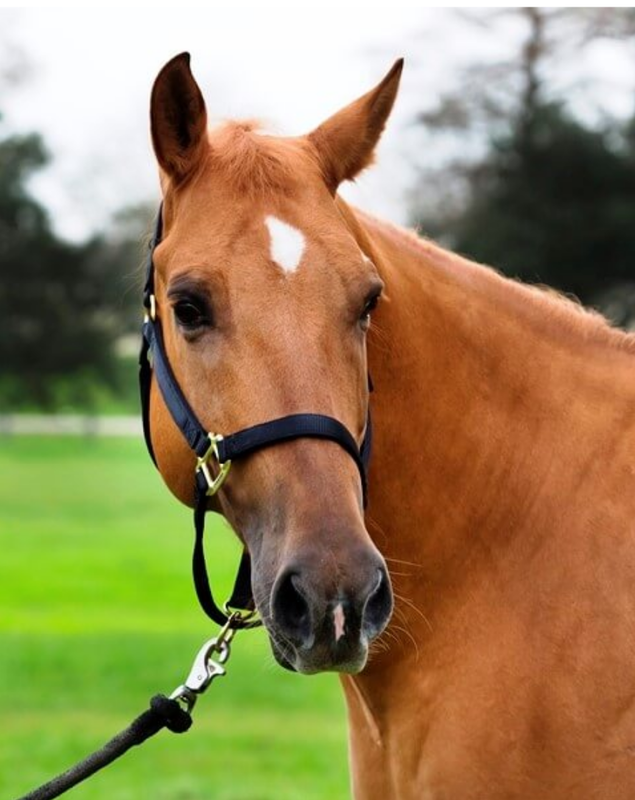 Conan was born in 2004 and has served in the New Orleans Mounted Unit since 2011. Fun Fact: Conan was used on the line by an Angola guard before coming to NOPD. He also had his 15 minutes of fame by appearing on several episodes of Louisiana Lockdown, a reality show depicting the events at the Angola Prison. Conan has adjusted well to his new job as an NOPD horse and enjoys the attention he gets while patrolling the streets of New Orleans. High Noon is a Dutch Warmblood Gelding. His coat is Bay and he stands 15/2 hands high. High Noon weighs about 1160 pounds and his favorite treat is carrots. High Noon was born in 2000 and has served in the New Orleans Mounted Unit since 2011. Fun Fact: High Noon has become one of the best police horses in our barn. He is fearless and remains calm through the worst conditions, his first major event with NOPD was goal post security during the Sugar Bowl in the Superdome along with several other horses. His father, a registered Dutch Warmblood stud just became part of the NOPD Mounted breeding program. B.B. is a Percheron/ Quarter Horse Mare. Her coat is Black and she stands 16/1 hands high. B.B. weighs about 1410 pounds and her favorite treat is cherries. B.B. was born in 2000 and has served in the New Orleans Mounted Unit since 2011. Fun Fact: B.B. is our most popular horse: she even has her own Facebook page (B.B. the Police Horse)! B.B. traveled to Oxford Miss for the LSU-Ole Miss game in Nov 2015 where she got to work with Oxford Police Horses and enjoyed the change of scenery. While there, she was able to teach the Oxford horses a thing or two about real police work. Lurch is an Appendix Gelding. His coat is a Dark Bay and he stands 15/3 hands high. Lurch weighs about 1275 pounds and his favorite treat is butterscotch candies. Lurch was born in 2004 and has served in the New Orleans Mounted Unit since 2011. Fun Fact: Lurch’s previous job was as a team roping horse in the rodeo before landing his job here at NOPD. Lurch is kind of a moody horse and pretends that he doesn’t like people but we believe it’s all an act because he wants people to think he is tough. He likes to play Bad Cop, Good Cop, with him being the bad cop. C.B. is a Percheron/ Thoroughbred Gelding. His coat is Bay with Hind White Socks and he stands 16/1 hands high. C.B. weighs about 1300 pounds and his favorite treat is sweet potatoes. C.B. was born in 2002 and has served in the New Orleans Mounted Unit since 2006. Fun Fact: Charlie Brown, affectionately known as C.B., has worked many special events including the festivities here when the Saints won the Super Bowl in 2010 and although the Saints were many miles away the crowds were as thick as a Mardi Gras season. C.B. had Medial Patellar Ligament surgery many years ago but had a full recovery and has served NOPD well since. Rose is a Dutch Warmblood Mare. Her coat is Sorrel and she stands 15/3 hands high. Rose weighs about 1180 pounds and her favorite treat is apples. Rose was born in 2013 and has served in the New Orleans Mounted Unit since 2016. Fun Fact: Rose is a new addition to the Department but promises to be a good police horse. She has a quiet disposition and a gentle nature. She is also the offspring of the newly acquired Registered Dutch Warmblood stud we have for the new breeding program. She should be on the street by Mardi Gras and will see her first parades this year. Dakota is a Percheron/ Appaloosa Mare. Her coat is a Brown and White Appaloosa and she stands 17 hands high. Dakota weighs about 1565 pounds and her favorite treat is grapes. Dakota was born in 2002 and has served in the New Orleans Mounted Unit since 2008. Fun Fact: Dakota is our only Appaloosa and is the favorite among part-time riders. Dakota has been ridden by Commander Walls for Mardi Gras during the Zulu parade and also several years for the Washington Parish opening day parade for the Rodeo. She is one of the largest but also one of the gentlest horses in the herd. Hero is a Registered Quarter Horse Gelding. His coat is Bay and he stands 16 hands high. Hero weighs about 1375 pounds and his favorite treat is watermelon. Hero was born in 2011 and has served in the New Orleans Mounted Unit since 2015. Fun Fact: Hero is a Registered American Quarter Horse off the Quarter Horse race track. He was too lazy for racing but that makes for a perfect police horse. Hero just recently got a full time rider as that rider’s horse retired so he and Hero are fast becoming new friends who will be working Mardi Gras together for the first time this year. Trouble is a Percheron/ Thoroughbred Mare . Her coat is a Brown and White Paint and she stands 17/1 hands high. Trouble weighs about 1510 pounds and her favorite treat is sugar cubes. Trouble was born in 2003 and has served in the New Orleans Mounted Unit since 2008. Fun Fact: Trouble and Dakota came to NOPD at the same time. They came as loaners from Angola for Mardi Gras and worked out so well we purchased them both after the season, they were the first non-solid colored horses to be added to the herd. Trouble got to meet the mechanical horse from the War Horse play and their meeting made the local newspapers. Elio is a Percheron/ Thoroughbred Gelding . His coat is a Dark Bay and he stands 18/1 hands high. Elio weighs about 1780 pounds and his favorite treat is peppermints. Elio was born in 2007 and has served in the New Orleans Mounted Unit since 2012. Fun Fact: Elio is our tallest and heaviest horse. Because of his size he is a big attraction when people come to the NOPD Stables. He is named after a gentlemen who was the member of a social club that donated money to purchase a horse. Hand Grenade is a Percheron/ Quarter Horse Gelding . His coat is a Red Roan and he stands 15/2 hands high. Hand Grenade weighs about 1395 pounds and his favorite treat is cherries. Hand Grenade was born in 1998 and has served in the New Orleans Mounted Unit since 2000. Fun Fact: Hand Grenade is truly a war horse. He has never missed a day of work due to illness or injury. He has traveled to many places to represent the NOPD including Washington D.C. for the Memorial, Kentucky for a competition, Washington Parish for the Rodeo Parade, Mobile Al for instructor training and Oxford Miss for the Ole Miss/LSU game. Sky is a Dutch Warmblood/ Thoroughbred Mare . Her coat is Grey and she stands 16/2 hands high. Sky weighs about 11410 pounds and her favorite treat is alfalfa treats. Sky was born in 2012 and has served in the New Orleans Mounted Unit since 2016. Fun Fact: Pam Fortner also purchased Sky at the same time she and Earl purchased another horse for the unit and they are not the first horses purchased by Pam and Earl. Many years ago they also purchased Hand Grenade for the Department. Hand Grenade has proven his abilities and soon Sky will get her chance to shine as a Police Horse on the streets of Bourbon. Hermes is a Percheron/ Thoroughbred Gelding . His coat is Roan and he stands 15/3 hands high. Hermes weighs about 1435 pounds and his favorite treat is grain. 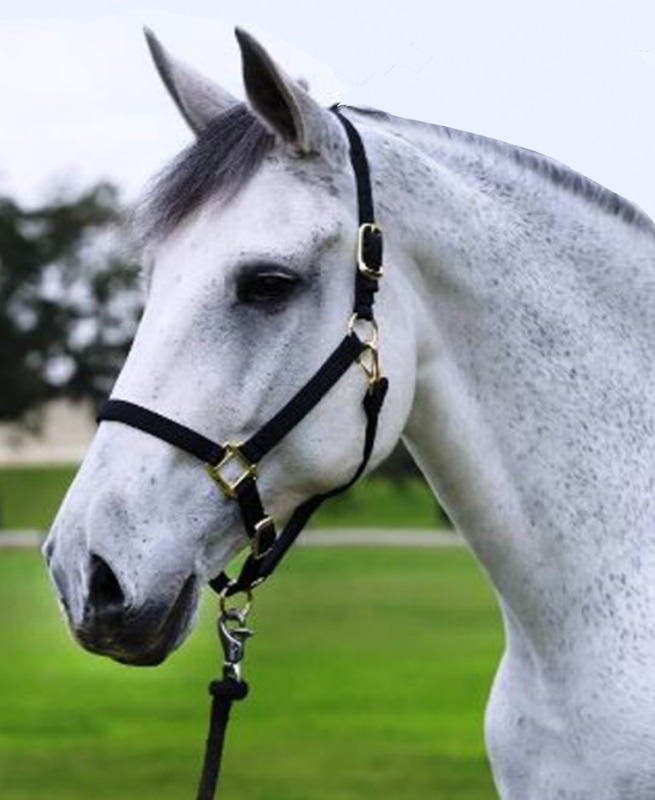 Hermes was born in 2009 and has served in the New Orleans Mounted Unit 2014. Fun Fact: Hermes was purchased by Mr. Coleman, who has generously donated to the Mounted Unit in the past. He requested that the horse be named Hermes after his parade crew which we happily obliged. Hermes has worked the last couple of Mardi Gras Seasons and has had the opportunity to see his namesake (the Hermes Parade) on the route. J.J. is a Percheron/ Thoroughbred Gelding . His coat is a Dark Bay and he stands 17 hands high. J.J. weighs about 1500 pounds and his favorite treat is watermelon. J.J. was born in 2008 and has served in the New Orleans Mounted Unit since 2013. Fun Fact: J.J. was also purchased for the unit by Mr. Coleman. Mr. Coleman asked that he be named J.J. in memory of Mr. Coleman’s own father. Mr. Coleman has been a long standing member of the Hermes crew and has traditionally ridden in front of the parade. J.J. is very determined and doesn’t back down, no matter how chaotic things may get on the street. J.C. is a Quarter Horse Gelding . His coat is Grey and he stands 16 hands high. J.C. weighs about 1300 pounds and his favorite treat is unknown at this time. J.C. was born in 2005 and has served in the New Orleans Mounted Unit since 2017. Fun Fact: J.C. is another donation by Mr. Coleman, who has been very generous to the Mounted Unit. He is new to the unit and hasn’t yet made it to the street but he is being put through the preliminary evaluation and seems to have a solid foundation so we believe he will be ready for patrol very quickly. Endy is a Percheron Mare . Her coat is Grey and she stands 16/1 hands high. Endy weighs about 1740 pounds and her favorite treat is carrots. Endy was born in 2012 and has served in the New Orleans Mounted Unit since 2016. Fun Fact: Endy was bought in Sept when we learned Angola was shutting down their breeding program. She was picked based on her breeding and good temperament. She is not broke to ride and her purpose was always intended to be a broodmare. Endy recently gave birth to a stud colt “Tebo’s Stardust” who is already famous with the media. Endy is a natural born mom. Allie is a Dutch Warmblood/ Percheron/ Thoroughbred Mare. Her coat is a Dark Bay and she stands 16/2 hands high. Allie weighs about 1670 pounds and her favorite treat is raspberry alfalfa treats. Allie was born in 2012 and has served in the New Orleans Mounted Unit since 2016. Fun Fact: Allie was also purchased for our newly developed breeding program. She just had a beautiful and feisty filly, both Endy and Allie's foals are out of the same stud “Stardust” so we are hoping this filly becomes a great Police Horse. Allie is broke to ride but her primary function will be as a broodmare for the program. She is a very devoted mom, who watches over her baby closely. Grey Boy is a Registered Dutch Warmblood Gelding. His coat is Grey and he stands 15/3 hands high. Grey Boy weighs about 1280 pounds and his favorite treat is alfalfa treats. Grey Boy was born in 1996 and has served in the New Orleans Mounted Unit since 2016. Fun Fact: Grey Boy was shipped from Germany many years ago by a lady whose family later donated him to Angola, where he became one of their breeding studs. We purchased him when Angola terminated their breeding program. He produced many good police horses for Angola, some of which are already part of our herd and we are hopeful he will be just as a good as a police horse. Hail To The Nile is a Registered Thoroughbred Gelding. His coat is a Dark Bay and he stands 17/1 hands high. Hail To The Nile weighs about 1300 pounds and his favorite treat is unknown so far. 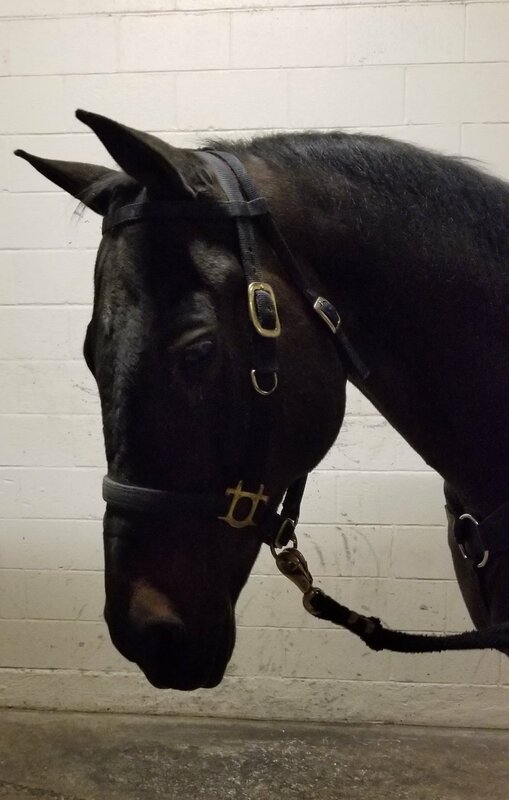 Hail To The Nile was born in 2010 and has served in the New Orleans Mounted Unit since 2018. Fun Fact: Hail to the Nile shares the same sire as “American Pharaoh”. They were both sired by “Pioneer of the Nile”. Nile ran many races and won several of them but when it was time for him to retire from his racing career he was donated to NOPD by Murray Valene. Mr. Valene believed he had the right temperament to be as good a Police horse as he had been a race horse. Nile was taken to Texas shortly after we acquired him and we did some police training with him which he responded to very well. We believe he has great potential and a bright future. Lola is a Warmblood Mare. Her coat is a Paint and she stands 15/3 hands high. Lola weighs about 1100 pounds and she doesn’t have a favorite treat yet. 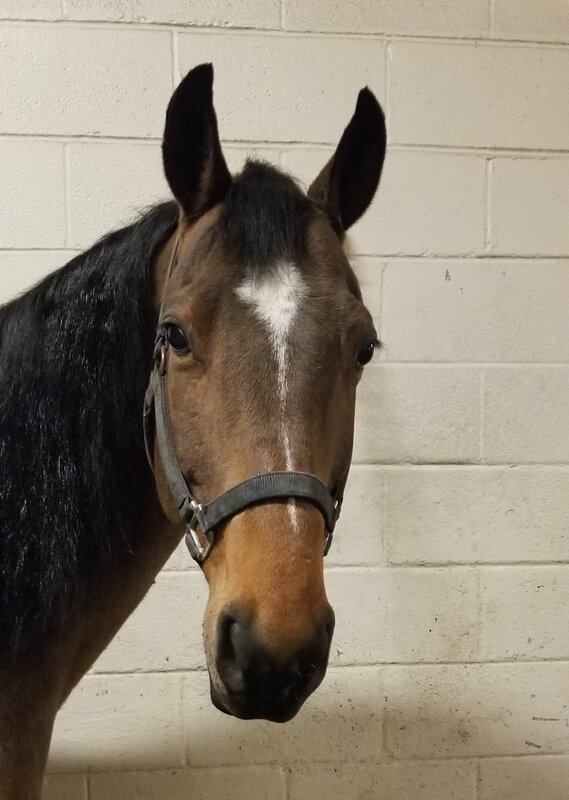 Lola was born in 2015 and has served in the New Orleans Mounted Unit since 2018. Fun Fact: Lola is new to the herd but she seems to have the perfect disposition for Police work. She was brought to Texas for a Police Conference where she was used for the security of a trail ride for many Police from agencies all around the country and she did a fine job. She’s been to Bourbon already and even worked a few special events, she seems to be great with the crowds and noise.